Instant Pot Loaded Baked Potato Soup is incredibly creamy and satisfying. The soup is easy to make and ready in just under one hour, with minimum effort! Loaded Baked Potato Soup is my definition of pure comfort food. All you need is a warm bowl of it, some crusty bread and a comfy blanket. I already have a Slow Cooker Baked Potato Soup recipe and a stove-top version of the famous Panera Bread Loaded Baked Potato Soup. Per popular demand, I am adding an Instant Pot version, that I promise, it’s very good. Instant Pot Loaded Baked Potato Soup is one of the creamiest soups you will ever try! 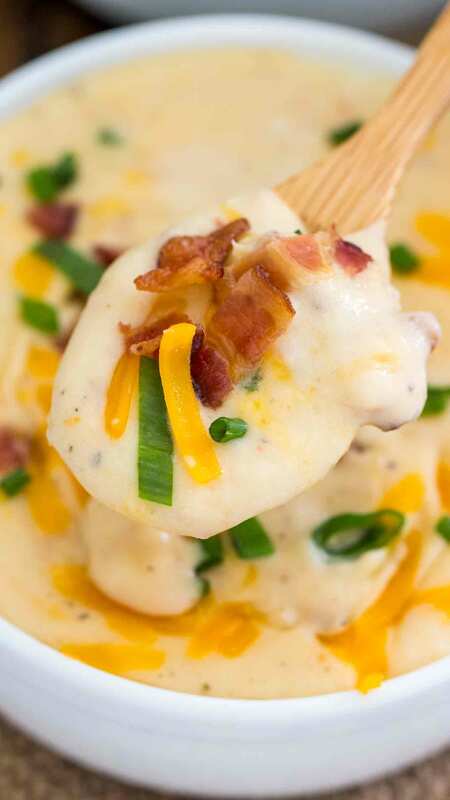 Just like a delicious baked potato, the soup is loaded with sour cream, lots of bacon and cheddar cheese. The texture of the soup is smooth and rich, perfect for dipping some bread into it. To make the soup as creamy, I have used a combo of sour cream, cream cheese, heavy whipping cream, and the secret ingredient is Cream of Potato Condensed Soup. This soup can be easily made vegetarian if you use veggie stock or broth and skip the bacon. Make sure to add lots of cheddar cheese and pile high the soup with your favorite baked potato toppings. 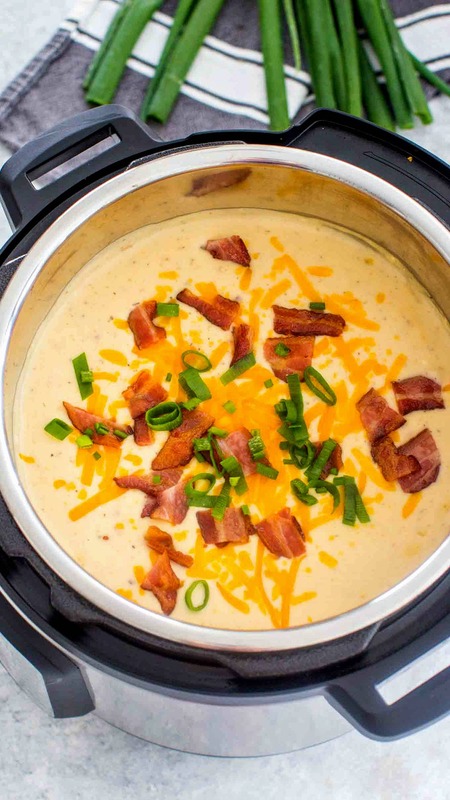 How long do you cook Loaded Baked Potato Soup in the Instant Pot? You have to cook the soup for 10 minutes on High Pressure, followed by 10 minutes of Natural Pressure Release. Also, it is important to mention, that it will take some time for the Instant Pot to come to pressure, between 15-20 minutes. That is because of the high volume of the soup. 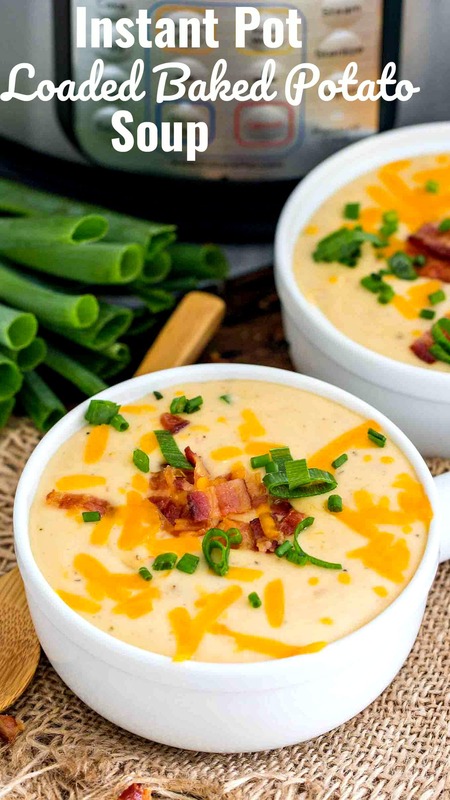 How do you make Loaded Baked Potato Soup in the Slow Cooker? If you don’t own a pressure cooker, no problem, you can still enjoy this soup by making it in the Slow Cooker. 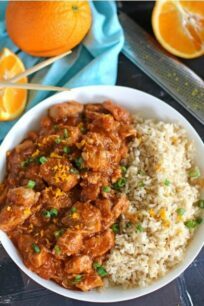 Check my popular recipe for Slow Cooker Version. How do you make Loaded Baked Potato Soup on the stove? If you prefer to make this soup on the stove, you can use my recipe for the famous Panera Bread Baked Potato Soup Copycat. It is very creamy and delicious. 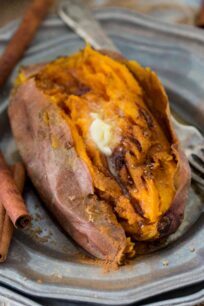 Use golden Yukon or Russet potatoes, they are perfect for this recipe. Also, adding some bacon to cook with the potatoes will add an amazingly rich flavor to the soup. Using fresh onion and garlic will also add lots of flavors. If you don’t like celery, you can skip it. Adding dry herbs, like thyme and oregano, will also add more flavor. In addition, to make the soup even more creamy, use an immersion blender to cream it. To cut on the calories, you can use light cream or milk. If you don’t have cream cheese on hand, you can skip it. However, keep in mind that the soup won’t be as rich. You can cook your own bacon crumbs or use store-bought bacon crumbs. I recommend using quart bags for this soup. First, use a cup to transfer the soup from the pot into the bag. Then, squeeze out excess air and seal the bags. The bags can nicely be stored in the freezer for up to 3-4 months. To thaw the soup, first, remove it from the freezer the night before serving, or put the sealed soup bag in warm water to thaw it faster. Then, heat in a soup pan, add more broth or milk if needed. Simmer for a few minutes. Potato Masher – this should be in each’s one kitchen drawer! Instant Pot – you know how much I love mine! I have a 6qt pot. Add all the ingredients listed under the "Cook on High Pressure" to the pot. Stir well to combine, make sure you don't go over the inner Max line of your pot. Close and lock the lid, point knob to sealed. Press High Pressure and input 10 minutes. It will take the Instant Pot to come to pressure about 15-20 minutes, due to the high volume of the soup. Once the pressure cooker is done the cooking, do a 10-minute Natural Pressure Release, after which, carefully release the remaining pressure by moving the knob to the Vent position. Lift the lid and use a potato masher to mash some of the potatoes. If wanted, use an immersion blender to cream the soup more. Select Sauté, and whisk in cream cheese, sour cream, bacon, and cheddar cheese until fully combined. It is great to use an immersion blender for this, it will make the soup incredibly creamy. Serve topped with favorite toppings. 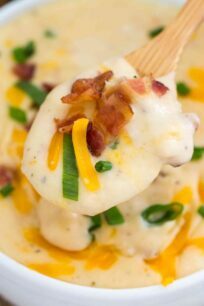 i love potato soup and this looks easy and delicious! This is exactly the kind of recipe I love to make when the weather starts to turn cold. It warms you up, and it’s just plain delicious. I can’t wait to bust out the instant pot for this one! I have a group of ladies coming over to make cookies. I am 100% positive that I will be making this for them! Thanks for this easy, quick and delicious recipe! Wow I want to eat it right now!!! Yummy!!! 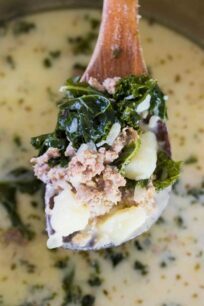 This is by far my favorite soup and this recipe knocks it out of the park!! This sounds amazingly good. I love potato soups and this one just sounds like it will top the others. This is kind of comfort food! I can’t wait to try this! I only have a 3 qt instant pot – Suggestions on a smaller batch please? Halve the recipe, I used a 6qt, so if you use halve it, it will work great. Whoa, that looks so good! The ultimate comfort soup! It looks so creamy! Perfect for colder nights! Oh my goodness, this looks incredibly delicious!! I can’t wait to try this recipe!! YUM!! Ahhh, potato soup. Who can say NO to this! I am sure this is delicious, I need to try it! This looks amazing. I could really go for some baked potato soup right now. I have never made this myself, but I do love it. I’ve been hearing seeing so many Instant Pot recipes lately so I definitely needs to get one soon. Your recipe looks all bacony and delicious (it literally made me hungry). I’ve been wanting to get me an Instant Pot because of all these delicious recipes that I’ve been seeing online. That looks yummy! OMG Girl! You are speaking my language today, bacon and potatoes in soup, YUM! This looks perfect for a cozy fall day. Wow this is rich and creamy to die for! After I tried this soup in the stove, I wanted a good recipe to make it in the IP, since I recently got my IP. I found your site and this recipe could not be any better. The soup turned out creamy and full of flavor, just exactly what I was looking for. I think its great you have same recipe in Slow Cooker, its truly a rich and delicious soup! Amazing. I didn’t add the bacon and I halved the recipe, which still worked great in my 8 quart. I don’t have heavy whipping cream in hand, is there a substitution I can make? light cream, half and half or whole milk. Is there a reason why there were ten commercials interspersed over the course of a one minute and twenty second video? If it’s something that happened because I accessed your website on mobile I understand if there was a glitch, but this is the third video that I’ve come across this on your website. I have no issues with ads normally as I realize people should monitize their work, but the sheer number and location of them is past bordering on ridiculous. That being said, thank you for the recipe. I most likely will give it and your other ones a try, but until the videos are unwatchable I will stick to the text. Thank you for letting me know Claudia, I will forward this to my ad company, it is supposed to be only one ad in the video so you have a good user experience. I am so sorry. I don’t have evaporated milk what do I do ? Hi Colleen, thank you very much for the sweet comment. I am so glad you have enjoyed the recipe. I keep seeing recommendations to not put dairy products in the Instant Pot during pressure cooking, however I’ve tried a couple of recipes that contain milk and other dairy products and they’ve turned out fine. Are there times when it’s not alright? Its ok to add them if they are NOT the only liquid, otherwise, it may burn.